The Division of Student Life helps Blue Hens build their sense of belonging and home at the University of Delaware as they develop personally, educationally, and professionally. From your New Student Orientation program to Career Services Center counseling and countless experiences in between, Student Life’s 12 departments are here to help you make the most of your UD experience. Throughout your time at UD, you may develop a question or concern, or experience a situation that you could use assistance in resolving. Particularly if you don’t know who to turn to, the Office of the Dean of Students is the perfect starting point - they’re here to empower you and help you find solutions. ODS staff is available to meet one-on-one to help you identify your concerns and develop a plan for moving forward, connect you with resources, advocate on your behalf, answer questions, or refer you to the experts on campus to get the information that you need. If you find that you are experiencing medical, emotional, psychological, familial or financial difficulties, the Office of the Dean of Students also offers personal assistance and services in these areas. As the primary champions of your experience and advocates for your voice, the Office of the Dean of Students want to hear from you. They look forward to connecting with you on campus and hearing about your UD experience. Connections to Internship and Job Opportunities - Over 5,000 employers recruit students for over 20,000 positions through on-campus interviews and the recruiting system, Handshake. Employer Engagement - Career fairs, meetups, networking events, information sessions, tabling, and other programs provide students with hundreds of opportunities to connect with employers visiting UD’s Newark campus throughout the academic year. UD Alumni & Parent Connections - The UD Career Advising Network, LinkedIn, on-campus networking sessions, class presentations, and discussions provide students with the opportunity to connect with alumni and parents who can offer career advice or help open doors to internships and jobs. Career Presentations - CSC staff engage academic classes, first-year student seminars, student organizations, and other groups in discussion on relevant career exploration and preparation topics. Online Resources - Vmock, Vault, CareerShift and InterviewStream are a few of the many resources that provide UD students with 24/7 access to relevant career preparation tools and advice. The Center for Black Culture develops and implements a full range of programs and services that expand educational opportunities for all UD students, and advocates for the needs and interests of Black and other underrepresented students. Commonly referred to as a “home away from home”, the CBC provides a supportive environment that encourages identity building, leadership development, and sense of belonging as you navigate your UD experience. Through the Each One Reach One (EORO) Mentoring Program, cultural programming and professional development initiatives, the CBC assists students in transitioning to University life and learning about all of the campus resources available to support their success. BSU is a student government that represents the interests of Black students in political and community matters. The BSU serves as a liaison between Black students and the University administration by taking active measures to enrich the environment for Black students. CPAB develops and implements large-scale annual events to enhance the Black student experience at UD, and to engage the campus community around Black cultural programming. CPAB events include lectures, comedy shows, concerts, and cultural performances that feature well-known public figures and entertainment acts. The Center for Counseling and Student Development, part of UD’s Division of Student Life, is the primary mental health unit on campus. All matriculated students who pay the Student Health Fee have access to individual and group counseling services through CCSD, whose psychologists, psychiatrists and graduate-level trainees are trained to assist students in making realistic goals and working toward the resolution of any personal concerns they may be experiencing. CCSD places strong emphasis on providing services and programs for students confronting typical development issues and tasks, as well as counseling for students whose emotional or psychological concerns are interfering with their ability to be successful in personal, educational, or professional pursuits. For more information including their confidentiality policy, visit the CCSD website. UD Helpline 24/7/365 - Students feeling anxious, depressed or overwhelmed can call UD Helpline at 302-831-1001 to speak with a mental health professional 24 hours a day, 365 days a year. Callers have the option of pressing 1 to request that a sexual assault victim advocate call them back within 10 minutes, or pressing 2 to connect with a counselor immediately. All Helpline professionals are familiar with the UD community and available resources. Facilitated through the Office of the Vice President for Student Life, the LGBT Program offers education, advocacy, and resources related to Lesbian, Gay, Bisexual, Transgender, Queer and Questioning (LGBTQ) students’ experiences on campus. The LGBT Program area promotes education around sexual orientation and gender identity and expression through ally trainings and presentations. Advocacy for LGBTQ students is offered in a variety of ways and some of these include, assisting students with name and gender changes and looking for support around the coming out process. Overall, the LGBT Program at UD connects LGBTQ students to relevant and needed campus resources. The Office of New Student Orientation seeks to ease the transition of new students and their families to the University of Delaware. Through comprehensive orientation programs such as new student orientations, Summit, and 1743 Welcome Days, NSO helps you set the foundation for a successful college experience and discover what it means to be a Fightin’ Blue Hen! Each year, NSO seeks energetic students to serve as Orientation Leaders who will help welcome the newest class of Blue Hens over the summer. Check out the NSO website in the fall for more information on this amazing leadership opportunity. The Office of Student Conduct, part of UD’s Division of Student Life, upholds the Student Code of Conduct by providing programs and services that manage campus behavior expectations; educating students about community stewardship; fostering students’ intellectual, ethical and cultural development; and intervening effectively when individual or group behavior violates the Code of Conduct. Appellate Board - Each year, OSC seeks students interested in building critical thinking skills and gaining leadership experience through participation in the Student Appellate Board, the final reviewing body for student conduct matters at UD. For more information and to apply, visit the OSC website. Residence halls at the University of Delaware are home to diverse, inclusive communities with over 7,500 freshmen, transfer, and upper division students. The University is a student’s home away from home, and living on campus is an integral part of the college experience. Numerous studies have shown that on-campus students achieve higher GPAs and a significantly higher degree of campus involvement and leadership experiences. Residence hall students also become part of a close-knit community and forge unforgettable connections. The majority of sophomore students live on campus, and many students spend all four years in the residence halls as a result of the close connection to UD’s engaging Newark campus. Complex Community Councils (CCC) are groups of elected hall leaders who advocate for change, develop programs, and support their fellow residence hall members. The Student Initiative Fund (SIF) provides money and guidance to assist individual residents to put on events for their floor, building, or complex community. It’s an opportunity for students to have a positive impact on their community. Neighborhood Empowerment Teams (NET) exist on every first-year floor. Through a partnership with RAs, students help plan fun floor meetings and events such as birthday celebrations, community service events, resident recognition and more. Floor captains and committee chairs are selected in late September. Community service opportunities exist through the First-Year Weekly Service program that matches each freshmen complex with a local agency. The RA Internship and Leadership Exploration (RAILE) program is an optional leadership development initiative that allows students to peek into the life of a RA, all while gaining exposure to valuable leadership skills and campus opportunities that can be applied to their professional goals. Our two Engagement Centers-located in Christiana and Harrington Commons-are vibrant hubs of engagement activities for students. These spaces are perfect for students to explore and expand on what they’ve learned inside the classroom. Resident hall students live in a variety of housing styles, including traditional single and double rooms, suites, or apartments.The halls are co-ed by floor, co-ed by wing, or co-ed by alternating room. We also offer one female-only hall and an All Gender option for Upper Division students. We are committed to building exciting and engaging environments in the residence halls. We are dedicated to supporting residents with resources, activities, and programs that foster a sense of community and learning. There are abundant involvement and leadership opportunities, and we seek every chance to partner with students to express their individual talents in a manner that enhances community life. Student Health Services, part of UD’s Division of Student Life, provides students with a full range of primary physical health care, urgent care, medical treatment, referral services and related health education. SHS is found in Laurel Hall, a freestanding ambulatory care center found at the far end of the south Green at the intersection of South College Avenue and East Park Place. Many services are covered by the mandatory Student Health Fee that all full-time matriculated students pay. For more information or to schedule an appointment, call or visit us online. Student Services for Athletes, part of UD’s Division of Student Life, is a comprehensive program of support services and life skills development. SSA assists student-athletes in making the best possible academic and personal adjustment to life at the University of Delaware. SSA staff work closely with coaches, faculty, and student services personnel to help student-athletes balance the demands of their academic responsibilities and participation in athletics. SSA assistance includes counseling, academic support, career development, teaching, and educational programming. Student Wellness and Health Promotion, part of UD’s Division of Student Life, creates a foundation for lifelong wellbeing by providing Blue Hens with the wellness tools to make healthy choices. The University Student Centers are here to help you maximize your time outside of the classroom. In their two centers, you will meet new friends, join vibrant and diverse student organizations, polish your professional skills, and make memories that will last a lifetime. With over 400 student organizations, a wide array of daily programming, and ample study and lounge space, they’re happy to serve as a major hub of campus activity. Some of the many USC offerings are highlighted below. Registered Student Organizations (RSOs) - With over 390 RSOs ranging from large to small, there is something to suit practically any interest. Overseen by USC, these groups include major programming groups such as the Student Centers Programming Advisory Board (SCPAB), student media outlets such as The Review (newspaper) and WVUD (radio), the StUDent Government Association (SGA), HOLA (Hispanic and Latino/a), and HAVEN (LGBTQQIAA). Fraternities and Sororities - The USC recognizes more than 40 National Greek Letter organizations on campus through their Student Involvement Office. They are grouped into four communities: the Panhellenic Council sororities, National Inter-Fraternal Council fraternities (IFC), Special Interest Greek Council chapters, and Multicultural Greek Congress chapters. Over 25% of UD undergraduates are part of one of these communities. These students have surpassed the average campus GPA for over a decade and are very active in the community and with various philanthropies. Students must have a 2.5 GPA to join these groups. Blue Hen Leadership Program (BHLP) - BHLP, coordinated through the USC Leadership Development Office, is a multi-tiered student leadership development program. Through a wide array of educational and experiential learning opportunities, participants develop strong leadership skills while developing marketable job traits by partnering with local nonprofits, as well as other organizations and departments on campus. Programming - The University Student Centers offer a wide range of unique programming for students to enjoy. Popular late night initiatives, Perkins Live (Friday nights) and Trabant Now (Saturday nights), feature headline performers and novelty activities for students to enjoy. All Perkins Live events and many Trabant Now events are free and provide students with opportunities to make new friends, see entertaining acts, win prizes, enjoy free food, and much more. Recreation - The Hen Zone game room has recently reopened after an exciting renovation. Located on the lower level of the Perkins Student Center, The Hen Zone offers billiards, table tennis, bubble hockey, foosball, board games, video games, and more. THE STUDENT GOVERNMENT ASSOCIATION (SGA), a registered student organization advised and overseen by the University Student Centers, is the student governing body of which all full-time matriculated undergraduate students are considered members. This organization assumes the responsibility of self-government, as delegated by the University faculty and administration. Its overall charge is to identify the needs of students and bring them to the attention of the administration, faculty, and City of Newark government officials. SGA interprets University policy to the student body and represents the approximately 350 Registered Student Organizations to the University administration. SGA consists of executive officers elected through a campus-wide vote. Committee chairs and members provide leadership for a variety of administrative and academic responsibilities. In addition, SGA appoints student representatives to University faculty and Board of Trustees committees. For more information, call (302) 831-2648 or visit the SGA website. An elected Senator represents each graduate academic program in the GSG Senate, and all graduate students are encouraged to participate in GSG monthly meetings and committee work. A group of officers, elected by the Senate, and the chairs for the various committees provide leadership for the organization. The Graduate Student Government is not part of University Student Centers. For more information about GSG, please visit the GSG website. Recognition is given to the importance of Religious and Spiritual Life as a valued ethical and moral influence in the development of the individual. Students are encouraged to contact the religious registered student organization of their choice and attend religious services of their preference. Most religious traditions are represented in the Newark area or in nearby Wilmington. There are a variety of registered student organizations on campus with religious and spiritual affiliation including: Baptist Student Ministry, Blue Hens for Christ (Church of Christ), Catholic Campus Ministry, Chabad House at UD, Episcopal Campus Ministry, Inter-Varsity Christian Fellowship, Kesher, Koach, Hillel Student Life, Lutheran Student Association, Muslim Student Association, Orthodox Christian Fellowship, Warriors for Christ Campus Ministries, Wesley Foundation (United Methodist Campus Ministry), Nurses Christian Fellowship, Chi Alpha, Lumos Presbyterian Campus Ministry, Reformed University Fellowship, Reformed University Fellowship-International Friendships, Athletes’ Intervarsity, and Better Together. For more information on religious registered student organizations, visit the Registered Student Organizations Directory found online at StUDentCentral. The Departments of Art, Music, and Theatre, along with the University Student Centers, the Institute for Global Studies, the Student Center Program Advisory Board, the Cultural Programs Advisory Board, the Library, Museums and Press, and the Performing Arts Series offer a variety of concerts, films, theatre productions, and art exhibitions at the University. The Center for International Studies and the Faculty Senate Committee on Cultural Activities and Public Events also bring many outstanding music, dance, opera, and theatre programs to the campus. For those wanting to take advantage of the campus proximity to New York, Philadelphia, and other cultural centers, bus tours are offered to the Philadelphia Orchestra series at the Academy of Music in Philadelphia, the Metropolitan Opera in New York, and other select museum exhibits and theatre productions. The Office of International Students and Scholars contributes to the internationalization of the University by offering programming opportunities for cross-cultural interaction and global engagement on campus and in the community. Programs include the weekly coffee hour, international film series, essay contests, and various field trips organized throughout the year. For details on particular programs or events, please contact the relevant department. You may also view the campus program and events calendar @UD and visit UDaily for up-to-date information on what’s happening around campus. Each year the Department of Music sponsors a full season of recitals and concerts by faculty, guest artists, and student performers. The campus community is invited to attend all performances; many are free, although an admission fee is charged for some concerts. Information about performance schedules can be obtained by calling (302) 831-2577, or online at www.music.udel.edu/news-events/events/Pages/default.aspx. Private study (vocal and instrumental) with a Music Department faculty member is available to full-time undergraduate University students on a space available basis. Non-music majors who pass an audition at the start of the semester may be accepted for private study either as music minors (two credits per semester) or through the Music Merit Award Program (one credit per semester). Freshman honors students who pass the audition are also eligible for private study (one credit per semester). All students taking private study are required to participate in a departmentally-approved ensemble. The faculty of the Department of Music participate in a number of ensembles including the Del”Arte Wind Quintet, the Faculty Jazz Ensemble, and the Taggart-Grycky Flute and Guitar Duo. Faculty ensembles and soloists perform regularly on campus and may be available for lecture-demonstrations, master classes, or performances. For scheduling information, call (302) 831-2577. In addition to renowned museums in nearby Philadelphia and Baltimore, students can engage with world-class material in four gallery spaces on the Newark campus. Whether it’s a casual or academic visit, students can explore new exhibitions and related programming each semester that are free of charge and open to all. In the 2018/2019 academic year, OLD COLLEGE GALLERY will feature exhibitions that highlight Inuit and Yup’ik art, illustration and narrative art, and caricature and satire. MECHANICAL HALL GALLERY will host exhibitions that showcase abstract art, and the SPECIAL COLLECTIONS GALLERY in Morris Library will spotlight forgeries and deceptions. The MINERALOGICAL MUSEUM, located in Penny Hall, displays approximately 350 specimens year-round, as well as rotating exhibitions like this year’s spotlight on a collection by gemologist George F. Kunz. Minerals on view include those from the collection of Irénée du Pont, which du Pont originated in the 1920s and gifted to the University in 1964, providing the foundation for further growth. Today, the collection contains approximately 3,000 specimens and is divided into a display collection and a reference collection. The student media of the University of Delaware are The Review student newspaper and the “Voice of the University of Delaware,” WVUD, 91.3 FM radio, which are professionally advised by the University Student Centers and operated by UD students. The University of Delaware’s Division of Intercollegiate Athletics and Recreation Services serves as the cornerstone of school spirit for the Blue Hens community and provides a variety of programs while educating students to be responsible, contributing citizens. This is accomplished by providing participation opportunities in fitness, club sports, intramurals and overall wellness programs while fielding championship-seeking intercollegiate athletics teams. The Intercollegiate Athletics Program includes 21 varsity sports, 8 for men and 13 for women. All programs compete in NCAA Division I as members of the Colonial Athletic Association (CAA). The football program competes in the Division I Football Championship Sub-division. Admission to regular season home sporting events, including football and basketball, is free for full-time undergraduate students. The Cockpit is the official student fan group of UD Athletics and all things Blue Hens! Membership to the Cockpit is free and students are encouraged to follow the Cockpit on social media for updates on special promotions, events and giveaways. Complimentary transportation is also provided from various areas on campus to the Athletics Complex. For more information, visit www.bluehens.com. The University’s athletics facilities include the 22,000-seat Tubby Raymond Field at Delaware Stadium (football, men’s & women’s lacrosse); the Bob Carpenter Center, which is a 5,000-seat multi-purpose building and practice facility that is home to the Blue Hen men’s and women’s basketball and volleyball programs (Acierno Arena) ; the 2,000-seat Fred P. Rullo Stadium, an artificial turf facility with two full practice fields that overlap a game field (field hockey); the Delaware Field House, a turfed surface providing indoor practice space; the outdoor Delaware Field House Courts (men’s and women’s tennis); Delaware Softball Stadium (softball); Bob Hannah Stadium featuring an artificial turf playing surface, heated dugouts, and three tunnel batting cage (baseball); Stuart and Suzanne Grant Stadium with an all-weather outdoor track (women’s track & field) surrounding a Bermuda grass field (men’s and women’s soccer); several other game and practice fields and the renovated and expanded Carpenter Sports Building which houses state-of-the-art recreational and fitness facilities as well as the Harry W. Rawstrom Natatorium (men’s and women’s swimming and diving). Women’s cross country competes at White Clay Creek State Park, men’s and women’s golf competes on several local golf courses and women’s rowing takes place on the Christina River in Wilmington, DE. Offering structured competitive opportunities in a variety of individual and team sports. Providing access to facilities and equipment for informal participation. Offering structured and non-structured activities for improving and maintaining physical fitness and the development of lifetime leisure activities. The Carpenter Sports Building (Lil Bob) is the primary recreation facility on campus. It offers a three floor fitness center outfitted with the newest technology in cardiovascular and strength equipment. In addition, the Lil Bob also offers an indoor swimming pool, indoor track, racquetball courts, a squash court, basketball courts, volleyball/badminton courts, an Employee Fitness Center, and indoor rock climbing wall. Recreation Services also manages four turf fields, satellite fitness centers housed inside two resident halls, along with two ice arenas, an outdoor pool (summer only), sand volleyball courts, and tennis and inline skating courts. A valid University of Delaware ID card is required to gain entrance to all recreation facilities. For more information and hours of operation visit www.bluehens.com/recreation. For more information about the ice arenas and skating programs visit www.udel.edu/icearena. For more information about the outdoor pool visit www.udel.edu/outdoorpool. Recreation Services provides an extensive co-educational intramural program. Intramural sports are those played on the University campus among students, faculty and staff. There are over 25 sports offered throughout the school year. Teams may represent residence halls, clubs, fraternities, sororities, or simply a group of friends. Leagues and tournaments are established for men’s, women’s, and coed divisions on three levels of competition and registration is ongoing throughout the year. Additionally there are some extramural opportunities allowing UD teams to compete against other institutions. Visit www.bluehens.com/intramurals for more information. Recreation Services operates three fitness facilities on campus. The award-winning Carpenter Sports Building (Lil Bob) is the primary fitness facility on campus. This space is highlighted by three floors of state-of-the-art strength and cardio equipment and an indoor track. Independence Fitness Center on north campus and Harrington Fitness Center on east campus are fully equipped with various strength and cardiovascular equipment. The Employee Fitness Center, designed to meet the needs of the UD faculty and staff, is also located in the building. The department also offers a full schedule of group fitness classes including BodyPump, Kickboxing, Zumba, Pilates, Yoga, UD cycle, and more. Visit www.bluehens.com/fitness for more information. Recreation Services provides additional recreational opportunities which include an indoor climbing wall located in Carpenter Sports Building with supervised instruction and practice to develop and improve climbing skills. These programs are scheduled to provide students with a safe learning experience while fostering an awareness and appreciation for the natural environment. Recreation Services also offers outdoor synthetic turf fields, an outdoor pool (summer only), along with basketball, tennis, sand volleyball, and inline skating courts. Recreation Services supports a wide variety of student-run competitive club sports. Club sports exist to provide students the opportunity to engage in high level competition while gaining experience in management, leadership, and organization. The students elect officers, create their own competitive schedules, organize travel arrangements, budget and plan financial transactions, establish their own bylaws and attend meetings held by the Office of Club Sports. The students run the club, but work in conjunction with the Club Sports Office and adhere to specific rules and regulations of the University. Currently, the University sponsors 37 club sport programs. Visit www.bluehens.com/clubsports for more information. The University of Delaware Police, Department of Public Safety is responsible for police and security services on the campuses of the University of Delaware. UD Police staff provide 24-hour-a-day response to reports of on-campus emergencies and criminal actions. Reports of emergencies or requests for assistance may be communicated directly over more than 200 “dial-free” campus emergency telephones, or by calling the University Police emergency number: 911. The Police staff are men and women who have met the police training certification requirements of the State of Delaware and who exercise full law enforcement authority on the campus and contiguous streets. The Security staff receive departmental training and assist the police by performing non-law enforcement duties. The most recent annual report of campus crime statistics is available, upon request, from the University of Delaware Police, Department of Public Safety, University of Delaware, Newark, DE 19716, phone (302) 831-2224 or visit www.udel.edu/police/crime-stats. Parking Services at the University of Delaware is designed to provide all students, faculty, staff, and visitors with adequate, accessible, and well maintained parking facilities. The University of Delaware is not liable for damage or theft to any vehicle or personal property on campus. Parking regulations help to ensure that there is an orderly system in place for all who use vehicles when coming to campus. The regulations also ensure that emergency vehicles and equipment have immediate access to all campus locations. Voluntary compliance is encouraged; however, individuals who disregard the University’s parking regulations will receive appropriate sanctions. A parking permit is required at all times to park on campus unless paying at meters or pay to park lots. Visitors must also either purchase a visitor pass or pay at meters or pay to park lots. Permits and visitor passes may be purchased online at www.udel.edu/permits. Please visit our web site, www.udel.edu/parking, for complete rules and regulations regarding parking on campus, permit options, information pertaining to each student classification, pricing, and map defining the UD parking perimeter or call Parking Services (302) 831-1184. Students are required to carry their UD ID card (the UD ONEcard). In addition to being their official University identification card, many student-related privileges are linked to the ONEcard. Examples of services that MAY be accessed with the ONEcard include the FLEX cashless spending account, permit parking, Library borrowing, student banking services with PNC Bank, admission to football and basketball games, Dining meal plans, electronic door access, computer-site printing, and the Carpenter Sports Building fitness center. Access to privileges is determined by registration status and account balances. Some services may be fee-based. 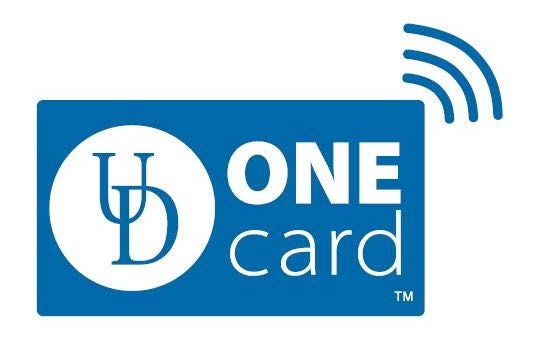 New and replacement ONEcards can be obtained at the ID Card office located in the Student Services Building, 30 Lovett Avenue, Newark. The office is open Monday through Friday, 8:30 AM - 5:00 PM. For students’ protection, a picture ID for positive identification must be presented before replacing/obtaining an ID Card. A charge is applied for replacement cards. Lost or stolen cards should be reported immediately, 24 hours a day, by calling (302) UD1-CARD (831-2273), or sending email to id-card@udel.edu. For more information, please visit www.udel.edu/onecard. Three all-you-care-to-eat residential dining locations- including the Caesar Rodney Fresh Food Company (Central), Pencader Residential Dining (North) and Russell Residential Dining (East)-offer a wide variety of menu choices across campus. University of Delaware Dining Services also provides numerous a la carte dining locations, including two food courts, multiple snack bars, five convenience stores and several national brand locations including Starbucks, Einstein Bros. Bagels, Subway, Quiznos, Chick-fil-A and Dunkin’ Donuts. A registered dietitian is on-hand for free, personal consultations regarding special dietary needs. Students living in traditional residence halls are required to select from the three available residential meal plan options for each semester/session. The purchase of a meal plan for Winter Session and Summer Session is required for students living in a residence hall during these sessions. Each residential meal plan includes a combination of meals, points and guest meals preloaded on the student’s UD ONEcard. Depending on the type of meal plan selected, the balance of meals and points will vary. Meals are redeemable for entry into the three residential, all-you-care-to-eat locations. Meals are not redeemable in food courts, convenience stores or other retail dining locations. One point equals one dollar and points decline like money on a debit card. Points are accepted at all of our dining locations and balances can be added any time throughout the semester by visiting udel.edu/diningrequest. Unused points from summer session, fall semester and/or winter session may be carried over to the next semester/session. At the end of the spring semester (after Commencement) all unused points are forfeited, have no refundable value, and will not be redeemed. Each residential plan includes five guest meals to treat a friend or family member to a meal. There are three residential meal plan options: the Unlimited Plan, the 12 Weekly Plan, and the 155 Block Plan. Unlimited Plan: The Unlimited Plan gives unlimited meals per meal period to use at all-you-care to eat residential dining locations & includes a select number of points to use at our food court, coffee, snack bar and convenience locations. This plan allows for unlimited entries per meal period, with a 15-minute lapse required for re-entry. 12 Weekly Plan: The 12 Weekly Plan gives 12 meals per week to use at all-you-care to eat residential dining locations & includes a select number of points to use at our food court, coffee, snack bar and convenience locations. Meals reset to 12 every Sunday morning and do not rollover from week to week. This plan allows one entry per meal period. 155 Block Plan: The 155 Block Plan gives 155 meals per semester to use at all-you-care to eat residential dining locations & includes a select number of points to use at our food court, coffee, snack bar and convenience locations. The plan allows for one entry per meal period. Dining plans are billed on a per semester/session basis. For residence-hall students with a Housing Agreement, the effective dates of the housing and dining agreements are the same. For more information about University of Delaware Dining Services and meal plans, visit www.udel.edu/dining, contact (302) 831-6761 or email diningservices@udel.edu. 50 or 25 Anytime Plans: Provide a small number of both meals and points. 750, 450, 300 or 150 All Point Plans: Provide a specified balance of points. Unused points from summer session, fall semester and/or winter session may be carried over to the next semester/session. At the end of the spring semester (after Commencement) all unused points are forfeited, have no refundable value, and will not be redeemed. Meal plan selections and changes can be made at www.udel.edu/diningrequest. Students can change meal plans as many times as they want until the week prior to move-in weekend. After move-in weekend, students can request one change through the published deadline noted on the Academic Calendar. If an on-campus student makes no selection, he or she will automatically be assigned and billed for the default plan which is the 12 Weekly Plan. For on-campus students (including Christiana Towers residents), the fall meal plan selection will automatically be reassigned for spring unless the student makes a request to change meal plans. Requests to cancel a Dining Agreement for the current semester or session are granted only in limited situations and must be made in writing in accordance with the Terms & Conditions at www.udel.edu/dining. If the request to cancel the Dining Agreement is granted by the University, the student’s University account will be credited based on a proration of unused meals for the remaining days in the term of the Agreement minus two weeks (14 days), plus the value of any unused points. Any credit balance in the student’s University account may be transferred to a Flex account. For sessions or programs other than the Fall or Spring Semesters, applicable refunds will be calculated in proportion to the semester refund schedule. Dining Fees approved for the 2018-2019 academic year. Subject to change for the 2019-2020 academic year.